An armband projects a user interface onto the skin, enabling users to control devices with a larger touchscreen than is offered by many mobile devices. Credit: Harrison, et al. (PhysOrg.com) -- If you find yourself getting annoyed at the tiny touchscreens on today's mobile devices, you might be interested in a "new" yet overlooked input surface: yourself. A new skin-based interface called Skinput allows users to use their own hands and arms as touchscreens by detecting the various ultralow-frequency sounds produced when tapping different parts of the skin. Skinput is a collaboration between Chris Harrison at Carnegie Mellon University and Dan Morris and Desney Tan at Microsoft's research lab in Redmond, Washington. The researchers have shown that Skinput can allow users to simply tap their skin in order to control audio devices, play games, make phone calls, and navigate hierarchical browsing systems. 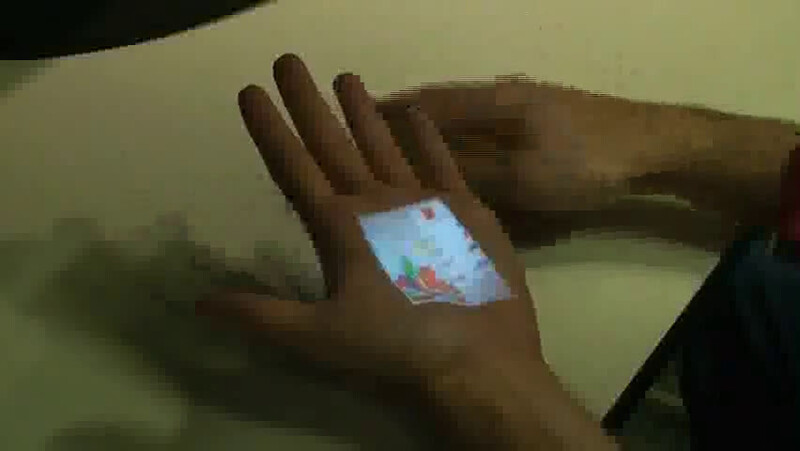 In Skinput, a keyboard, menu, or other graphics are beamed onto a user's palm and forearm from a pico projector embedded in an armband. An acoustic detector in the armband then determines which part of the display is activated by the user's touch. As the researchers explain, variations in bone density, size, and mass, as well as filtering effects from soft tissues and joints, mean different skin locations are acoustically distinct. Their software matches sound frequencies to specific skin locations, allowing the system to determine which “skin button” the user pressed. Currently, the acoustic detector can detect five skin locations with an accuracy of 95.5%, which corresponds to a sufficient versatility for many mobile applications. 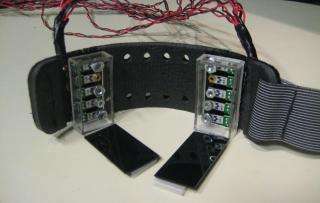 The prototype system then uses wireless technology like Bluetooth to transmit the commands to the device being controlled, such as a phone, iPod, or computer. Twenty volunteers who have tested the system have provided positive feedback on the ease of navigation. The researchers say the system also works well when the user is walking or running. In April, the researchers plan to present their work at the Computer-Human Interaction meeting in Atlanta, Georgia. Skinput interface input armband sensors. That's just fantastic! Nice surprise to end the night. I'm going to have some cool dreams tonight. Most likely not the first to pop the idea, but why not embed it in a watch? Skinput is a really mindblowing invention.It is going to change the way we are using mobile phone and other hand held media.